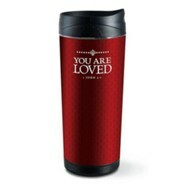 Convenient travel tumbler is accented with inspirational sentiment and features a tight-seal spill-proof lid and insulated interior for your favorite beverage. 16 ounce capacity; frosted acrylic exterior with textured art insert; BPA free. Please note: We've tested this tumbler for hot beverages. It is suitable for hot coffee, tea, or cocoa though we don't recommend adding liquid at the boiling point. I'm the author/artist and I want to review All Things are Possible Travel Tumbler.